A crunchy snack and great garnish too! I’m a sucker for crunchy toppings of all kinds and crispy chickpeas are a particular favourite, adding a burst of delicious protein to my day. I love tucking them into lunch boxes for a yummy pick-me-up snack as well as using them to garnish soups, salads and cooked vegetable dishes. They’re so easy to make at home whether you use an air fryer or conventional oven and you can play around with all sorts of interesting flavour combinations. I still love my salt and vinegar roasted chickpeas but these chili-lime ones just might be my new favourite. Tossing the chickpeas with spices after roasting them helps keep the seasonings from burning and tasting bitter. Spread rinsed and drained chickpeas out on paper towel to dry, removing any loose skins. If using air fryer, preheat air fryer to 400F. If using oven, preheat to 400F and place a rack in the middle. Put chickpeas in a broad, shallow bowl and drizzle with olive oil. Toss gently to coat evenly. Put chickpeas in basket of air fryer or, if cooking in oven, spread chickpeas out in a single layer on a baking sheet. Do not clean the bowl you had the chickpeas and oil in as you’ll be using it again. 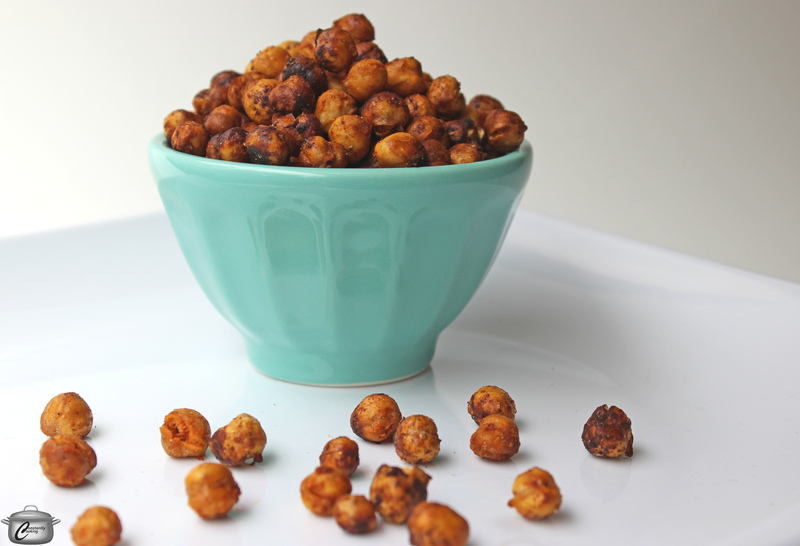 Roast the chickpeas in the air fryer for 25 – 35 minutes, shaking basket every 5 minutes. In oven, roast for 40 – 45 minutes, jiggling the baking sheet occasionally. The chickpeas will turn a dark golden brown and get crunchy. If you take them out of the oven or air fryer too soon and discover they are not completely crunchy, put back in for a few minutes more. While chickpeas are roasting, whisk together the lime juice, chili powder, paprika and cumin in the same bowl you used previously. 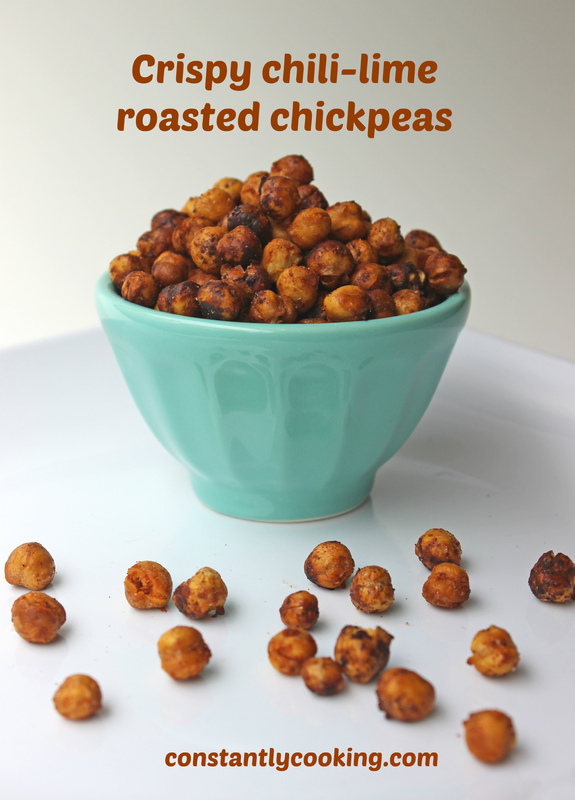 Remove roasted chickpeas from air fryer or oven and add to seasonings in bowl then very quickly toss to coat. Sprinkle with salt and toss again. Return to air fryer or oven for 5 minutes more to dry out the lime and spice coating. Transfer to a clean, broad bowl to cool completely and serve at room temperature. Makes 2 cups (500 mL) of crispy chickpeas. This entry was posted in healthy and tagged air fryer, back to school, chickpea, chili, crispy chickpeas, garnish, gluten-free, lime, Paula Roy, plant-based, protein, roasted chickpeas, school lunches, snack, tasty, vegan, vegetarian, what to put on salad, what to put on soup. Bookmark the permalink. Wow ! Looks so delicious & tempting! Thank you – they sure are tasty and it’s nice to have a guilt-free treat!